Installation: - Uninstall older version. - Extract ZIP in any folder and start iFonz.exe. The program use Calibri.ttf and install it automatically at start, but if it can't find \Windows\Fonts it start with Arial font. For Install Calibri font go to Utils folder in iFonz directory and copy Calibry.dat in \Windows\Fonts folder and rename it in Calibri.ttf. - For now the program work only in Portrait mode. - In Programs page the back wallpaper can't set for now, for more speedly animations, if I find a good code for this I add wallpaper. - I have deleted the TaskBar in top for a better usage of Windows Mobile. 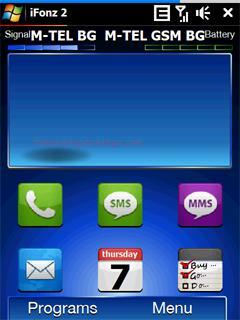 - If you click on Day, Clock or Hour the program open Clock Settings of Windows Mobile. - If you click on Operator name or Signal Bar the program open Operator settings of Windows Mobile. - If you click on Battery Bar the program open Battery settings of Windows Mobile. - If from Home page you slide from right to left you open Programs page. - The Calendar icon in homepage notify the appointments that you have in the day and in the next day. - If you want back in Serch files list you can click on address in bottom and return to the back directory. 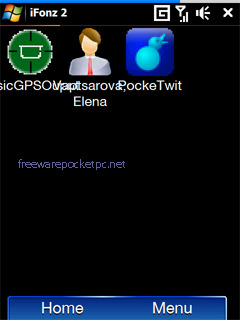 - For lock device and show a big image of caller whe you receive a call use S2U2 program (The best ever from A_C).